Film Plot: Mary Shelley reveals the main characters of her novel survived: Dr. Frankenstein (goaded by an even madder scientist) builds his monster a mate. Grade: C7-C8	Fine to Very Fine. Folded, single-sided. A few minor edge tears, a tiny missing chip of paper in the upper right corner, minimal handling/edge wear. UK quad posters from this period were printed on thin paper that easily becomes tanned and brittle with time -- this poster does not exhibit any of these common flaws. 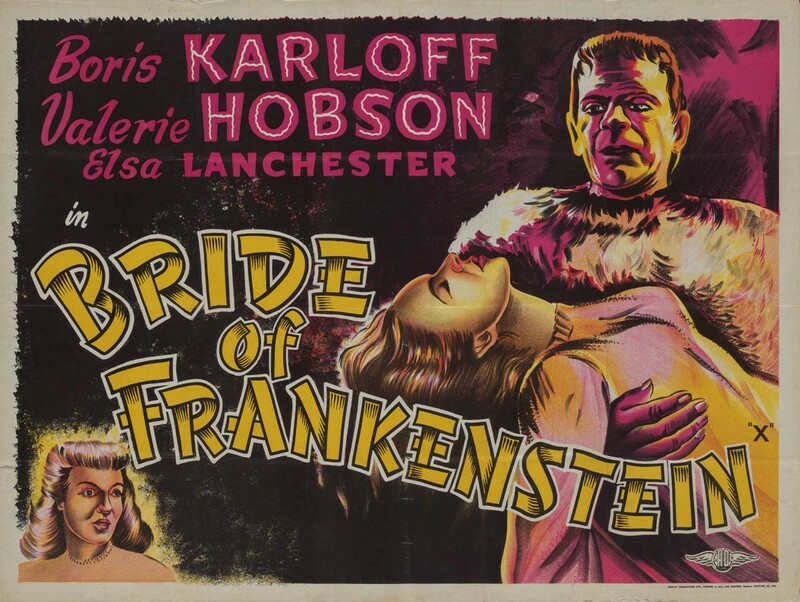 Frankenstein and Dracula, both released in 1931, were landmark films in the horror genre; a fact borne out in the valuations of the few remaining posters in the hands of collectors today. 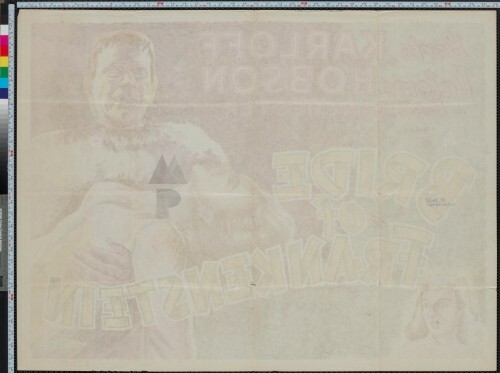 Posters for these films consistently rank at the very top of the market — original 1-sheets for these films run into the hundreds of thousands of dollars! Bride of Frankenstein was the first of many sequels to Frankenstein and quite possibly belongs in the elite group of films that surpassed their predecessors. 1st release posters for Bride are nearly impossible to find, which has also driven up the price of later re-release posters including the absurdly rare UK quad poster offered here. 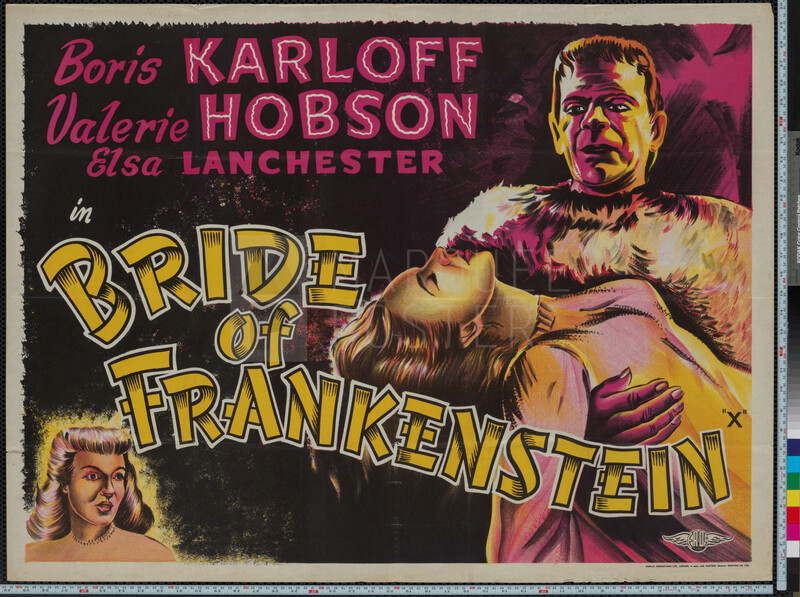 However, while re-release posters from the late 30s, 40s and 50s for Dracula and Frankenstein were graced with incredible artworks (and valuations to match), the only time Bride of Frankenstein got a stand-alone re-release in the US it ended up with a somewhat lack-luster image. This UK quad bucks the trend with a dynamic image and bold colors — breathing new life into the monster and his mate. Once this is gone it will be long time before another of these rare post-war re-release quad posters surfaces.